The material has been so useful to me in my daily practice. It completely changed how I approach patient teaching and patient consults. I think that every health professional should take this course. Heather K. Naylor, Hospital Pharmacist, Canada. "I just passed my test and I am so excited to have the background this program has provided. I have put these techniques to use in my life and I am loving the results. There were many concepts in the class that brought me realizations about myself. I feel the class benefited me as much as it will benefit my interactions with my clients. Thank you." Cynthia Dale, RDN, Guys Mills, PA.
"I love how this program actually teaches you how to converse with clients!" Kimberly Melillo, RN, Dracut, MA. "You guys should be proud. I did a program for Certificate of Completion from a distinguished university and spent 4 times as much, and didn't come close to learning these concepts as you teach them!" Cynthia Dale, RDN, Guys Mills, Pennsylvania. "I really enjoyed this course. Part of the reason is I sensed the developers/teachers of this program are genuine people-centered practitioners who care about patients besides merely providing a service commodity. I sensed this in the written material and during the webinars." Sosena Kebede, MD, Baltimore, MD. "The NSHC Health Coach Certification program was one of the very first critical steps I took when branching out on my own as an independent practitioner. Many medical professionals are gifted with medical expertise and knowledge, but they often fall short on their ability to facilitate change with their clients. The invaluable education I learned through NSHC gave me the much needed tools to be able to effectively partner with my clients and guide them toward better health. If practitioners are looking for a must-have tool to launch their business, this is it!" Jacqui Bryan, BA,RN,MS,CHC, WHE, FNLP (Independent Practice) , Rye, NH. "My NSHC Certification equipped me with the tooos to offer professional and effective behavioral therapy for my weight-loss patients in a clinical setting. Incorporating the skills I learned in my Health Coach Training has greatly impacted the outcomes of my patients in their effort to lose weight and gain health." Dr. Angela Jones, DNP. MSN, FNP, CHC (Independent Practice), Jonesboro, AR. "This certification means as much to me as passing my nursing boards. It has been the most meaningful & valuable training offered by my employer in the 10 years I have worked at my company!" Melissa J Gomez , RN, Accordant, CVS Caremark. "I highly recommend NSHC's program because it is interactive, has skills practice online and the information is evidence-based!" Sandra Brown, Veterans Administration Hospital, North Little Rock, AR. "I found the program very helpful and quite thorough. I've recommended the program for all of our nurses." Melanie Morton, RN, Blue Cross Blue Shield of TN. "It has been so helpful to be able to apply this coaching style to my area of nutrition that it makes me very enthusiastic to share with fellow colleagues." Dana Kearney, MS, RD, Nestle, USA. "I have attended so many conferences and seminars in my 22 years of nursing , none has been so personally enriching as the Coach Clinic! Very effective! This methodology should be taught in Nursing Schools! Thank you for the great experience!" Cherry Zablan, RN, NY, NY. "The information our nurses gained from the CoachClinic® was invaluable! Having the class onsite allowed us to ask questions and practice what we learned. Going forward, the information gained from CoachClinic® helps us set more patient-centered goals and motivate behavior change. It has changed the way in which we communicate with those in our Chronic Disease Management Program. A great speaker and a very worthwhile program"
Mary Mabe, RN, CCM, CHC, First Carolina Care, Pinehurst, NC. "Excellent program! Great speaker, very energetic! Very informative!" Maureen Postel, Ruby Gordon, Ann Marie Conte; Tiffany & Co. NY, NY. "The NSHC CoachClinic® was excellent; definitely the most important workshop we've had! Exceptional content, excellent speaker. Thoroughly enjoyed the day and look forward to certification!" St. Luke's Health Network, Bethlehem, PA.
"Motivational Interviewing should be taught in EVERY HCP academic program! This style of communication provides the best patient outcomes and satisfaction." Randall Salyer, Community Physicians of Indiana, Indianapolis. "Our home health agency is moving toward a chronic care model in which health coaching is a vital part. I highly recommend this program!" Patty Beard, Outcomes Specialist, Advanced Home Care, High Point, NC. "We researched all health coaching certification programs and found this one to be valid and one that incorporated the type of program we were looking for! NSHC has a very effective way of presenting the materials!" Linda Kosa-Postl, Allegheny/Western Steuben Rural Health Network, Inc., Wellsville, NY. "The NSHC CoachClinic® really opened my eyes to the way that we're trained to communicate with patients can actually be hindering goal achievement! I found the exercises quite helpful in assisting me to change my own behavior!" Vicki Carrion, RN, Proctor & Gamble. Cincinnati, OH. 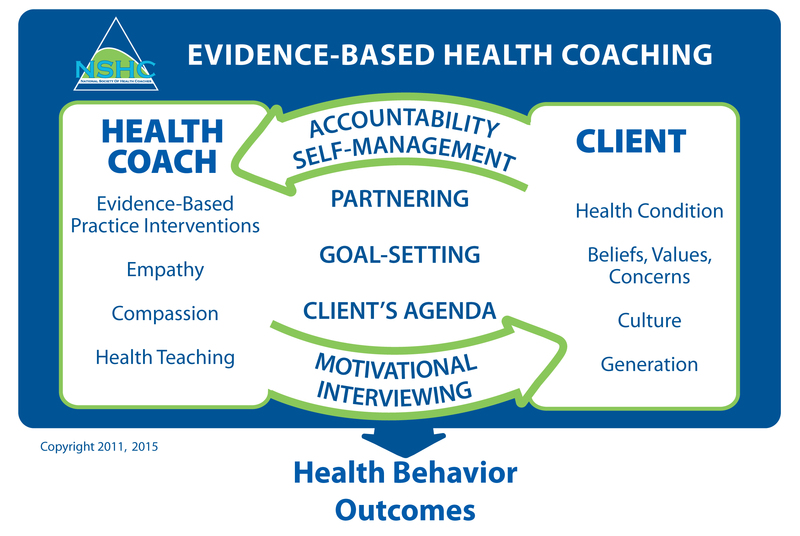 "NSHC has developed an excellent program with evidence based theory; exactly what I was looking for to start a Chronic Disease Management program in our clinic using the Health Coach Model." Cheryl Dalton, Access Family Care, Cassville, MO. "NSHC's health coach certification establishes the pillars for exploring all the benefits of health coaching for both HCPs and patients. It's extremely relevant to my practice!" Marc Thoma, MD, AstraZeneca, Belgium. "I have found NSHC's materials to be very thorough and practical. I like that it is condensed and immediately relevant to my clinical practice as a family medicine provider!" Dr. Denise White-Perkins, Senior Staff Physician, Dept. of Family Medicine, Director-Institute on Multicultural Health, Henry Ford Health System, Detroit, MI. "Solid resource for staff! Concept applications and quick quizzes throughout are great. It's all you need to get started in health coaching!" Karyn Scully, RN, Past President, Broward County Association of Rehabilitation Nurses, Fort Lauderdale, FL. "Becoming a certified health coach through the National Society of Health Coaches is a critical skill for today's medical clinician! I am a certified Physician Assistant (PA-C) with over 35 years of clinical experience and Director of a PA Program. The transtheoretical model (TTM) of counseling patients and clients used in this program is the gold-standard approach to healthy life-style change. We need more health coaches with these counseling skills!" Gary R. Uremovich, DMin MPAS PA-C CHC. "I found the content in "Health Coaching Made Easy for Healthcare Providers" straightforward, practical and easy to follow. The exercises, pocket guide, and quizzes at the end of each chapter are great because it helped me focus on key concepts. This program is great for any healthcare provider who is interested in effectively guiding individuals to their optimal state of health and wellness." Julie Chiu, RN, MS-BC, Director and Founder Mindful Eating Lifestyles Limited, Hong Kong. "An extremely useful and insightful course of instruction. Excellent job of weaving knowledge and research into a very practical manual for use. Excellent patient case examples"
Dr. William Haffey, CCO, Vericare, Coronado, CA.